WE ARE CIVIL and STRUCTURAL ENGINEERS. H2B has built a solid foundation providing civil engineering services to non-profit organizations, including places of worship. We partnered with Kirksey Architecture to design the much-needed parking area for the Houston's First Baptist new downtown campus. The 39,460 SF building and surface parking lot occupies an entire block of downtown. The design includes renovating the assembly hall into a flexible worship space seating up to 600 people, providing a welcome center and café, classrooms to accommodate preschoolers through adults, and church administrative offices alongside rentable office space. HFBC is also creating a co-working space on the third floor for like-minded ministries and non-profit groups to work together. The worship center will open in early 2018. The project has been nominated for a 2019 Houston Business Journal Landmark Award. Thank you to Kirksey Architecture and HFBC. We make a great team! H2B recently provided civil engineering services for the Center for Education and Enterprise, the centerpiece of the Brookwood and Beyond campaign. The Center encompasses 41,000 SF and is uniquely designed as a neuro-considerate designed building, more than doubling their current workshop and warehouse facilities and creating a conference and meeting area. The full master plan will significantly expand the Brookwood Community with major components including: Center for Enterprise and Education; Citizen Activities Center; Two New Residences for Citizens and Staff; Off-campus Retail and Day Programs; Enterprise Programs and Center for Learning Start-up Funding; and Infrastructure Improvements. These new facilities will allow for more Brookwood citizens to participate in vocational, residential, education and recreational programs, and expand the outreach program. 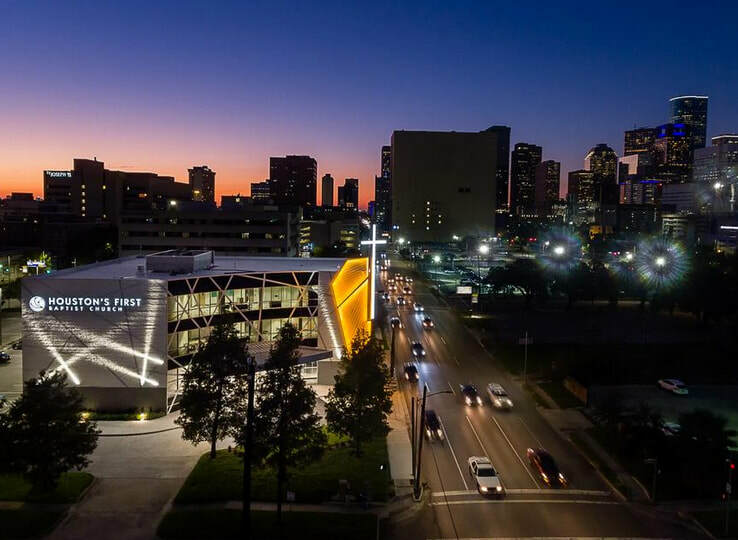 H2B has teamed on a new favorite landmark with Michael Hsu Office of Architecture by providing civil and structural engineering to what is now crowned "the most creative neighborhood shopping destination located in Houston!" Heights Mercantile, the 45,000 SF low-rise urban district located on the site of a former Pappas Restaurants warehouse at the intersection of Yale Street and 7th, aimed to be a new kind of shopping and dining destination when it opened in the summer of 2018, and it delivered. With high profile tenants, instagrammable appeal, and immediate, enthusiastic embracement by the surrounding historical neighborhood, the project has attracted first-to-market, slightly unusual businesses that appeal to area's unique and independent spirit. The development includes six buildings - four of which are original - bisected by 7th Street and across from the popular Donovan Park, with green spaces and picnic tables. A newly built two-story structure accommodates boutiques and offices, a restaurant, fitness studio, salon, spa, and clinic. The Museum of Fine Arts, Houston will also put in a gallery space with rotating works from the museum's collections. MFAH's contemporary pop-up gallery will be a first in Houston and MFAH's first public-private partnership. The project's developers donated the space to MFAH, allowing the museum to expand outside of its main campus for the first time. The project recently won a 2019 ULI Development of Distinction award. Game on! H2B provided civil engineering services for the new Aveva Stadium, home to the Major League Rugby team the Houston SaberCats. The 41-acre, 3,500-seat, $15 Million sports arena is located in south Houston, near Airport Boulevard and Highway 288. Aveva Stadium's overall facilities will include an 1,100 parking lot and two secondary fields for multipurpose use. While seating capacity exceeds 3,000, the stadium will feature up to 4,000 maximum capacity by utilizing standing room only areas. 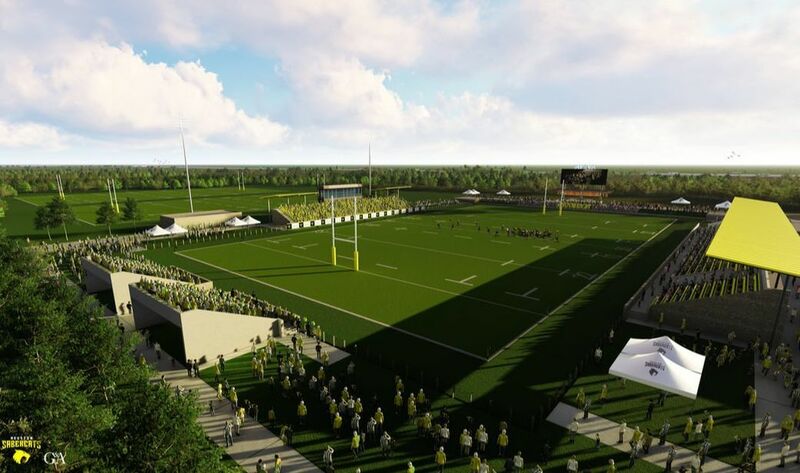 ​The SaberCats, one of nine new Major League Rugby franchises, plans to finish the new facility in mid-April, in time for the second half of the 2019 season. Special thanks to Goulas & Associates, the architects. We made a great team! H2B worked with the design team, led by m Architects, to provide civil and structural engineering for Walker Engineering’s new corporate headquarters located in northwest Houston. This ground-up project on a previously undeveloped site includes 20,000 SF of office space and 10,000 SF of warehouse storage, along with new driveways, parking lots, sidewalks, an entry court and a detention pond. The design takes advantage of cost-effective tilt-wall concrete construction, while providing a unique identity by accentuating entry features with company branding using rhythmic patterned colored facades. Numerous strategies for energy and employee efficiency were utilized such as site orientation, interiors full of natural light, cooperative work spaces, and high-efficiency LED lighting. Sculpted electrical conduit features are on display in public areas further integrating company trade and brand for this prominent electrical engineering and construction company. H2B, Inc. is a Service-Disabled Veteran Owned Small Business (SDVOSB) and a HUB firm in the State of Texas. Click here to see all of our certifications. ​Click here for a copy of our qualifications. “m ARCHITECTS has been working with H2B for 10 years. We have always found their engineers to be responsive and professional, providing quality services for a reasonable fee. They are our go to firm for civil engineering services in and around the Houston area. I recommend them for all our commercial projects." "H2B is a very service oriented firm. They are flexible in creating solutions, conscious and considerate of the design intent, and very prompt in their response to the various time constraints that every project has. I have been pleased to work with them on one of our more challenging projects and hope to collaborate on others soon." "At Story Architects, we value our continued working relationship with H2B Engineers. H2B has provided Civil and Structural consulting services to Story Architects on multiple projects for over 5 years. H2B has always been responsive to Story Architects questions and project needs with the highest level of professionalism. H2B is my "go to" engineer for Civil and Structural services." "We handle many design/build projects. We have had incredible success using H2B for both civil and structural design. They are always more than willing to take the extra effort with permitting challenges. We will continue to use H2B."